Wake up and dream: Mandrake in the Mall - "witch"craft 2.0??? I found on a message board on the website of the film an "analysis" of the plot. One very interesting point in the analysis is "The log line of the movie is, 'Innocence has a power evil cannot imagine.' The message here seems to be that in order to remain innocent within a world [which appears] sometimes full of evil, one must avoid the mistake of being cut off from the feminine, creative side of their brain which is the part of us capable of great imagination and compassion." I wrote in my original blog: "Last week on Santa Monica's Third Street Promenade, I saw the wonderful movie Pan's Labrynth, whose protagonist is a young girl rediscovering her power through visionary encounters with a Pan. Pan is a creature associated with ancient lore and mystery. I won't give it away, but one of the central characters in the movie is a mandrake root -- used in old world medicine and 'witches oyntments.' This mandrake has also appeared in Harry Potter movie and books. 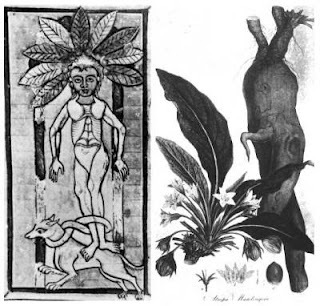 Mandrake is part of the "deadly nightshade" family of plants, highly toxic, but even so they were used by indigenous cultures for their spiritual and medicinal properties. Research shows that the mandrake (known as “duda”yim in Hebrew) is mentioned in the "midrash" as part of a treatment or increasing fertility. Modern uses of Mandrake derivatives are as an antispasmodic and as a treatment for Parkinsons. A very close relative of mandrake, Datura, is equally mysterious, and dangerously toxic; it was prescribed in European "witchcraft" to treat asthma. Similarly, its chemical derivatives are used in modern medicine treatments as well. Here in the Los Angeles region, highly skilled Chumash healers used Datura as an anesthetic for setting bones, to treat bad bruises and wounds, to "freshen the blood" and to treat hemorrhoids. The Chumash also used it for their shamanic ceremonies. Datura also known as "jimson weed" from Jamestown - in 1700 the British at Jamestown colony in Virginia ate datura, and many of them went blind or crazy as a result. The wisdom of plants has been used all over the world for centuries to improve physical health and psychological well-being. Plants that have demonstrated beneficial effects include herbs, roots, cacti, mushrooms, trees, succulents, seeds, flowers and mosses. At the same time, as noted by some of the examples above, not all herbal remedies from plants are for common use, as some (especially plants like mandrake and datura) are highly toxic and dangerous if misused or misunderstood. However, many cautions surrounding herbal medicine, both now and in ancient times, have often been misguided or used as a tool for oppression. For example, during the Inquisition by the Medieval Catholic Church, the definition of "witchcraft" included knowledge of herbs, as "those who used herbs for cures did so only through a pact with the Devil, either explicit or implicit." "Witches" could be executed by burning. The violent suppression of anything resembling "nature-connected medicine" has left a residual scar on our collective psyche, which has only started to heal in the last few decades. An even more controversial trend today is the large number of medical marijuana clinics popping up all over Los Angeles. A friend of a friend of mine is a real "Lance Armstrong" case. He's in his middle thirties with an advanced form of rare cancer, undergoing chemotherapy treatment. He's strong, radiant and positive as he has ever been. He says he's never been happier in his entire life, really! He's a real hero. He is currently using medical marijuana to treat the debilitating, and very unpleasant, side effects of chemotherapy; he has said that the ONLY thing that helps him are his medical marijuana treatments -- far more effective, he says, than the very expensive and toxic pharmaceuticals. Herbal remedies may have been persecuted in another age, or even questioned by the "traditional" medical establishment today. However, now nature-based medicine is being brought back into our consciousness everywhere we turn, through children's books and movies in the mall, herbal counters at Whole Foods and our local acupuncturist. This resurgence of old "mysterious" herbs in our modern media only points to the often misunderstood, and historically persecuted value in earth-based wisdom. Parallel to the resurgence of nature based medicine in our modern society is an equally challenging trend; with the advent of chemical pharmaceutical drugs, we've seen a steady decline of traditional medical systems and cultures all over the world during the last few decades. The wonderful recent post "Why Craft is Worldchanging" by the WorldChanging team discusses the importance of all forms of "craft" to bring about a more sustainable society. Still, I believe in this post, one of the more misunderstood "crafts" of nature based medicine was overlooked. To bring Nature into our medicine cabinet is to connect us deeper to the very Nature based intelligence and cultural heritage we aim to protect and restore." I love it! One thing I believe in is the homeopathy of using locally grown (esp. wild) plants. I wouldn't venture to use the native Daturas without a lot of training from wise elders but there are so many edible wild greens and other medicinal tasty foods (and isn't good food really medicine???). I'm intrigued by the flying ointments. Also intrigued by the accounts of those witchy women being found in barns cowering with the livestock. Visionary experience gone awry or biased account of the story from the author of the history? I think wise experimentation is perhaps the only way to find out.